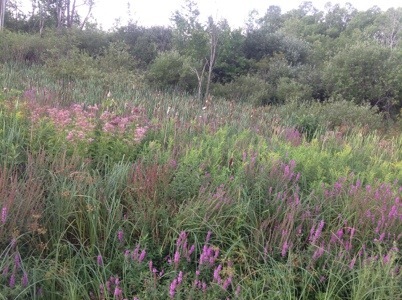 There is a desperate struggle in our local wetlands between the native plant that creates habitat for butterflies and birds called Joe Pye Weed (Eupatorium purpurea) and the invasive plant species, noxious weed and habitat thief known as Purple Loosestrife (Lythrum salicaria). As both wetland plants are in bloom right now, the competition is obvious. Driving around the Glens Falls, Saratoga, Clifton Park, Lake George, and capital district of the North East, I see the battle in motion and color. 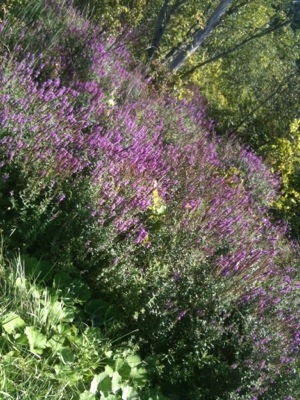 In my garden designs, I use Joe Pye Weed in every garden that the home owner is receptive to it. I know that slowly and steadily the birds will spread it into nearby areas: wetlands, recently disturbed habitats and generally any available, fertile space the seeds fall. The more Joe Pye seeds spreading through our ecosystem, the better of a chance our wetlands have for self-remediation. Ecology is a beautiful and potent system; but in the fight against invasive species the ecosystem needs our pro-active participation if restoration is a possibility. 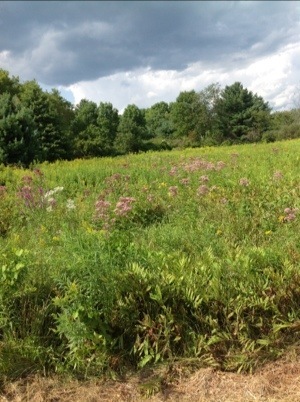 Ecologists make dismal estimates about percentages of habitat loss due to land disturbance and invasive species; I don’t focus on the numbers but instead insistently design with native plants in gardens in Saratoga- Lake George- Clifton Park. 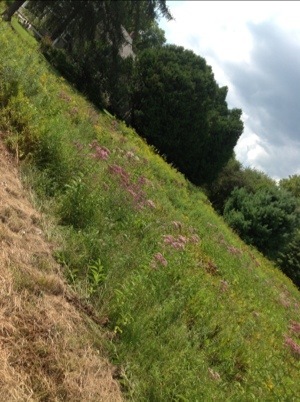 And when I see a wetland off the side of the road flooded with Joe Pye Weed, I am filled with joy.